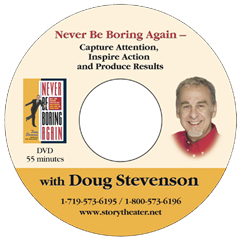 This video program features Doug’s keynote based on his book of the same title. DVD format. It includes Doug’s Airport Story and the content is informative and inspiring. This 55-minute video lets you watch Doug in action and see The Story Theater Method in application. Watch and study physical humor and body language, while Doug teaches Story Theater techniques.